Cream butter and sugar. Add eggs and beat. Mix in oatmeal. Add and mix in soda, cinnamon and flour. Pour into a greased 9x13 cake pan. Bake at 350F for 35-40 minutes. Mom and I made this together recently with some leftover oatmeal that my husband had cooked. He’d put in dried cherries, so we reduced to the sugar (to the amount given above) and it came out really well. We also omitted the cinnamon and put some almond flavoring in instead. Then at the last minute we added chocolate chips! It was really good, and not too sweet. We substituted white whole wheat for part of the flour as well, but I don’t remember the proportions we used. 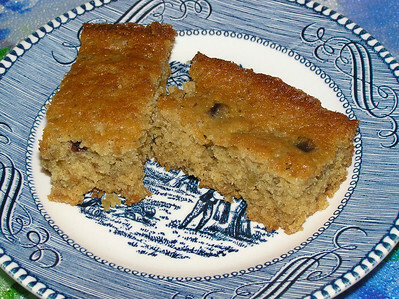 Anyway, this is a quick and easy cake, a nice way to eat leftover oatmeal, and quite versatile! Use it for breakfast, for coffee cake, for dessert, tea, lunches, or just for a healthier sweet snack. Try your own variations too. As you can see in the picture, the batch I’d made there had raisins or cranberries in the oatmeal. Greetings from Finland! Thanks for sharing! I had left overs and didn't want to waste it either. I think I'll give it a try! Thanks for posting! I have made cookies with leftover oatmeal before but never thought of a cake. In fact, I was looking for a link to make those said cookies to send to my mother-in-law because she didn't believe me it could be done when I mentioned doing it. :D That's how I found this site and I'm glad I did. Thanks for stopping by. I hope you find some things here to encourage and interest you - and maybe even a few laughs. :-) My mom has made this cake for years. Hope you enjoy it.